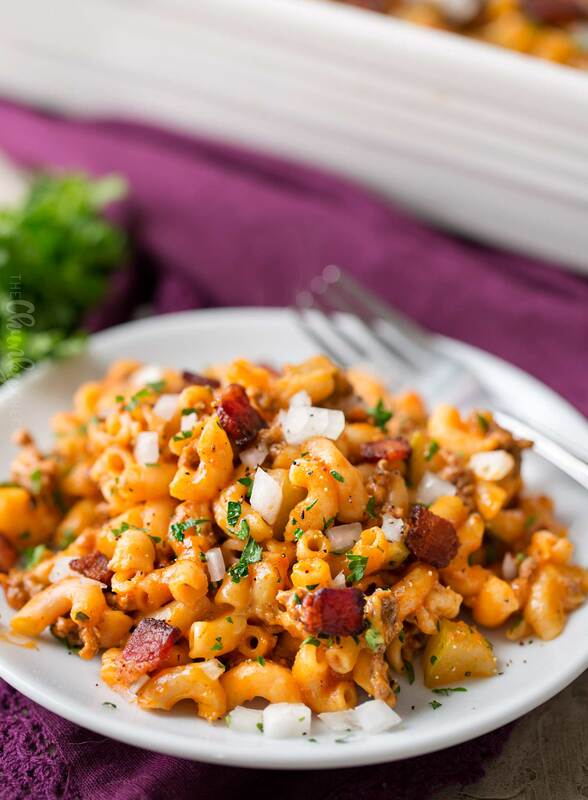 My favorite one pan pasta meal ever… since there’s no boiling required, AND no babysitting the pan on the stovetop. Just pop it in the oven and enjoy the deliciousness!! Great bacon cheeseburger flavors, with just 10 minutes of prep (and no prep-cooking!). Happy 2018!! That’s still so weird to type… it’s going to take some getting used to. I’m that person who is still writing the previous year for like 5 months into the new year. Absentmindedness at it’s best I suppose! Anyway, did you have a fantastic holiday and New Years Eve? I sure hope so. Ours was amazing. We spent plenty of time as a family, had a wonderful Christmas holiday, our daughter got to spend some time with her Grandparents, hubby and I had a long overdue impromptu lunch date (kidless!! ), and we both got to actually take some time OFF. We didn’t take any vacation this year, so my husband had some vacation time to use up and took off the week between Christmas and New Years, and I actually took some time off too. Well…. sort of. This job, for me, is a 7 day a week job, so I’m always working in some way, shape, or form. I don’t mean for that to sound like I don’t like it, because honestly, I love what I do and even though it can be grueling at times, I genuinely love it and it doesn’t feel like “work” 🙂 So last week I took the week off of content creation (actually putting new posts up and promoting them), and just worked ahead shooting two new recipes and some light photo editing. It was blissful! Look at me, chit-chatting away instead of getting to the reason you’re here today… to get this fantastic pasta bake recipe! 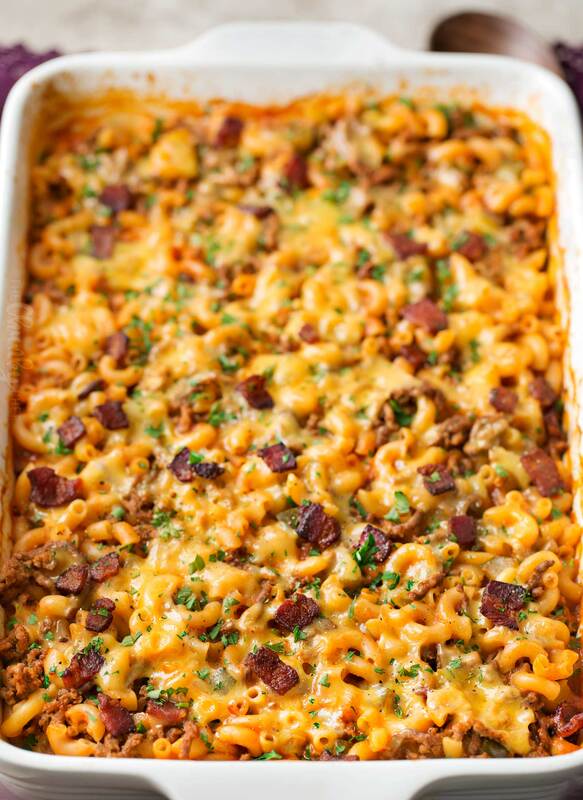 The story had a purpose though… to say that while that break was amazing, it’s back to work full force this week, which means I’m reaching for some go-to, easy one pan meals… like this bacon cheeseburger pasta bake! I’ve got a collection of one pot meals here on the blog, and you all have reached out to me quite a bit to say that those are the meals you love the most… so I’m super happy to bring this one to you today! This pasta bake is a little different though. 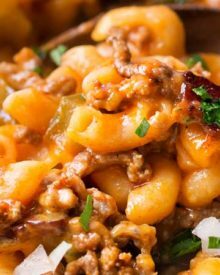 For most one pot meals, you have to cook the protein first, then the pasta cooks in the pot while it simmers on the stove. Easy enough right? But what if I told you it could get even EASIER??! There’s no need for boiling water here, no need to babysit a pot of simmering pasta, and no need to cook the beef beforehand. That’s right… you just add everything to the baking dish, cover it, and pop it in the oven. The beef cooks IN the oven, so you don’t have to spend time browning the meat! I realize that might be a little weird for some of you, and if you’re not comfortable putting everything in raw… no worries. There are instructions in the recipe notes section for how to cook this recipe with browned beef. Make sure you’re measuring things. Normally I’m not super precise when cooking, but in this case, the ingredient amounts are set to make sure the pasta cooks fully, without a bunch of excess liquid. If you don’t want meat-covered hands, use some nitrile or latex gloves… they’re lifesavers! If you’re not an American cheese fan, use slices of whatever cheese you like on your cheeseburgers. The bacon and onion on top really takes this dish from good to great, so if you can, definitely add them! Parsley is optional. I always add something fresh to baked dishes, plus I wanted the photos to look pretty. I’ve never made this with other pasta types, but I think a small to medium shell pasta should work just as well. 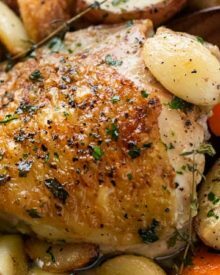 9×13″ baking dish – my actual baking dish pictured in this post is from Sur La Table, but I have this pan and it works beautifully! Big mixing bowl – with a variety of sizes, easy to clean stainless, non-slip bases, measurement marks on the inside, lids, AND grater attachments… these are my new favorite bowls, ever!! Nitrile gloves – I don’t have a latex allergy, I just think the nitrile ones are sturdier. Great for any time you’ll be handling raw meats, hot peppers or pungent garlic! 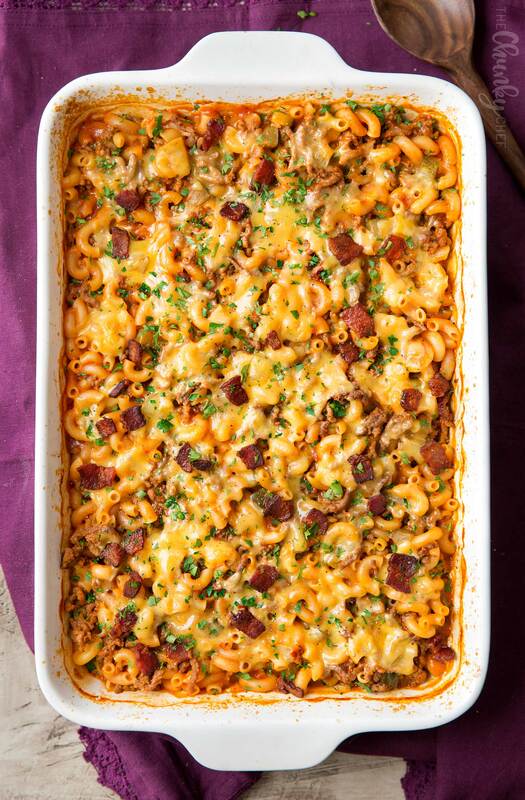 WANT TO TRY THIS BACON CHEESEBURGER PASTA BAKE? To a large mixing bowl, add water, tomato sauce, pickles, Worcestershire sauce, dry mustard, brown sugar, garlic powder, salt and pepper. Whisk to combine well. Using your fingers (I like to wear gloves for this part), crumble beef into small 1/2" pieces and add them to the mixing bowl. Add in dried macaroni and stir to combine. Pour mixture into prepared baking dish, cover tightly with aluminum foil, and bake for 25 minutes. Remove dish from the oven, remove foil, and stir well (don't forget the bottom of the dish and the sides too!). Top pasta with American cheese slices and crumbled bacon. Leave UNcovered and return to oven to bake another 5-7 minutes, until cheese is melted. Let dish cool 5-10 minutes before serving. Top with finely minced onion, chopped pickles and/or fresh parsley if desired. Use a pot that can go from stovetop to the oven (this enameled cast iron buffet pan is my go-to). Crisp bacon in pan on the stovetop, then remove to a paper towel lined plate. Add beef and lightly brown (as in, don't cook it 100% all the way through), crumbling as it cooks. Drain beef. Don't spray a 9x13" dish, you'll be using the one you cooked the bacon and beef in. No need to crumble the raw beef, you've already cooked it. Just add in the browned beef at the point the recipe calls for the raw meat. Made this for a houseful of boys, they loved it!! Super easy and delicious. Will be a regular in this house! This literally tastes just like a bacon cheeseburger! My entire family loved it, even my picky teens. This recipe is definitely a keeper. We doubled the recipe and did the cast iron pan method using cooked bacon and beef. Thanks so much! Made this for a group of about 60 people. Super easy and everyone loved it. 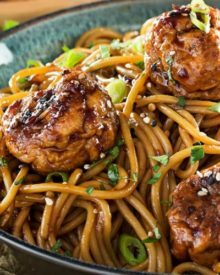 I love how easy this dish is to make! 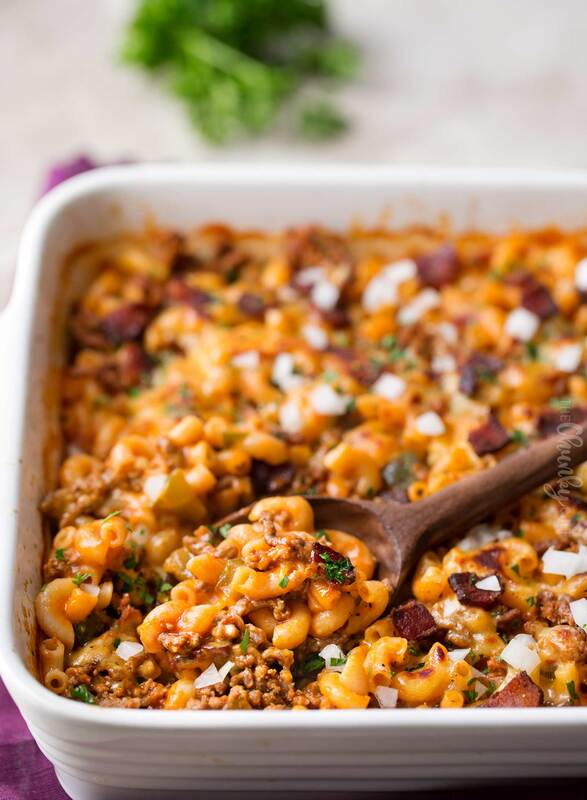 So cheesy and delicious! 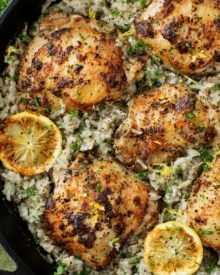 Such an effortless meal – perfect for busy weeknights! This is totally my kind of dish. My family will love it! My son is going to flip! All of his favorite things in one dish! 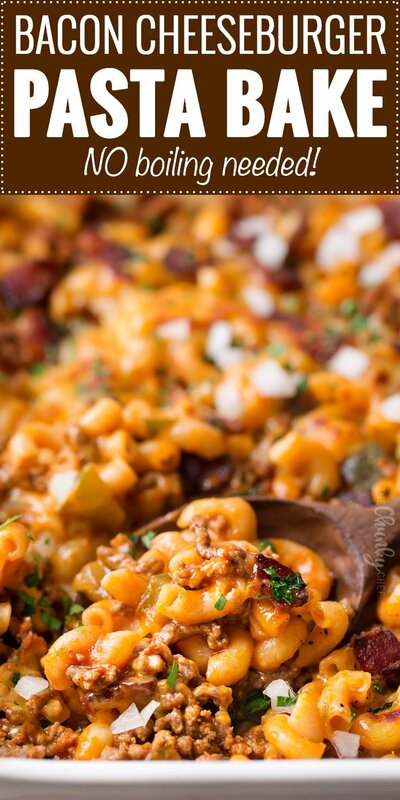 great for potlucks and I love the bits of bacon! Your photos are fantastic! I’m glad you were able to get time “off”!